Religious people, including evangelical Christians, are generally supportive of science. On the other hand, they often distrust scientists. There are some valid reasons for distrust – when some of the loudest voices condemn or belittle religion portraying science as true enlightenment. Elaine Ecklund and Christopher Scheitle conclude their book Religion vs. Science: What Religious People Really Think with some thoughts on productive ways forward. 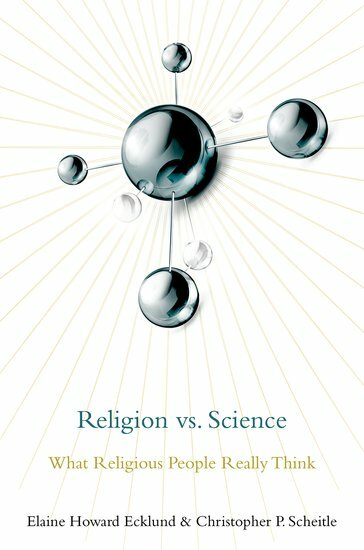 First, they note that “most, if not all, of the apparent tensions or conflicts between religion and science for religious people can be tied to concerns about what a particular scientific issue means the perceived role of God in the world or the perceived sacredness of humanity.” (p. 140) This is an important observation because it allows us to focus on the most significant issues. As a scientist and a Christian I find that there is no intrinsic conflict between science and God’s action in the world or the sacredness of humanity – in fact, scientific study and pursuits can provide means to alleviate suffering and promote human flourishing. Certain views – e.g. young earth creationism – are in conflict with science. The question for religious people (especially evangelical Christians) is whether young earth creationism is the only faithful interpretation of Scripture. I don’t believe it is the only or even the best interpretation of Scripture. Other views – e.g. eugenics – are in conflict with religion, but these are not ‘scientific,’ they merely exploit science to achieve an end. Second, religious people and scientists need to talk face-to-face. Segregation serves to feed the myth and prevent progress. The conversation is most effective when religious scientists act as a bridge between faith communities and the scientific community. They are (or can be) capable of talking both languages and will generally take both claims (science and faith) seriously. Unfortunately, many feel pressure to stay under the radar on both sides of the issue – unwilling to rock the boat by discussing science at church or religion at work. It is destructive to take a hardline position quashing discussion – no matter what the leader’s view on evolution or climate change or … While a few may feel comforted by such an approach, many more will find the environment stifling. Where can a young science student, or an established scientist for that matter, go to critically think about the compatibility of science and faith? The topic is ruled off-limits at church often leaving the last or only word to those who deride any faith position. Not only is such an approach destructive to the faith of some within the church, it puts a roadblock in the path of those who are not believers, but might otherwise be open to considering the question. Both books, Elaine Ecklund’s Science vs. Religion: What Scientists Really Think and Ecklund and Scheitle’s Religion vs. Science: What Religious People Really Think are worth reading and pondering as we try to move beyond the myths and into the future. You may also comment on Beyond the Myths and Into the Future at Jesus Creed. This entry was posted in Science and Faith and tagged Christopher Scheitle, Elaine Ecklund. Bookmark the permalink.